There's a lot more to a good safari truck than just de-roofing a Toyota 4WD. First, let me be clear, I am not saying that you have to pay exorbitant money for your first/next African safari. What I do recommend, however, is to ask a few questions before you book. Not only will you get better bang for your buck, but ultimately you should have a more ethical and more comfortable safari, too. But, and this is a big but, while paying a fair price should benefit you, the local community and ultimately Africa’s wildlife, there’s one thing it will never guarantee: that you will see more animals or spot the ones you want to. How do I know? Because I have safaried at the polar ends of the budget scale (plus a few in between), from camping in a holey, smelly tent in the Serengeti, to a recent couple of decadent evenings in perhaps the most luxurious lodge within a lion’s roar of Kruger National Park, Ivory Lodge, in adjacent Sabi Sands. Where, ahem, I even had my own butler. Tent, three-star, or five-star, the animals you’ll see is just a matter of being in the right place at the right time. Such is nature’s serendipity. Of course, a thousands-of-dollars-a-night private lodge will (or at least should) win in every other department; spas, private plunge pools, signature cocktails and service to make you feel like a lion king or queen. And the current reality is that the high-end experiences have the resources to answer the questions below better than many a budget operator. But not always. So it’s time to set some expectations for the safari you want: ethical, comfortable and well-rounded. Instead of just saying “woo-hoo, my God, things are cheap here!” start by asking yourself how much you would like to be paid (as a professional tour guide) for driving a group of tourists around the wilderness for a few very long days. If the price an operator quotes you seems too cheap to be true, then someone, somewhere along the way, is not making a fair wage. As a backpacker in the ’90s, I watched my guide tear up when I told him (after he asked) how much I had paid for the safari (versus what the operator had paid him). The difference was monumental. Ensure that you have both a driver/guide and an animal tracker on board – they are two specialist jobs, often filled by locals (especially the tracker role). Having only a driver will save you money, but the sharp eye of a tracker who’s grown up in the area may be the difference between seeing the ‘Big 5’ and the ‘Big 2 or 3’. And, just because a company says that it’s Fairtrade, doesn’t mean that it necessarily is. If in doubt, keep those questions coming! 2. How do you treat the animals? Despite your need for that award-winning (or at least lounge-room-wall-filling) photograph, remember that closer is not always better for your subjects. On one budget safari I was on in the outstanding Ngorongoro Conservation Area (Tanzania), I was in a pack of eight vehicles that were literally chasing a lion that in turn was chasing a young zebra. The pursuit clearly affected the outcome of that day’s hunt; several times we got in between the two, for a better vantage point. Yay, for the young zebra, you might say, but this is not your Circle of Life to meddle in. Because of the varying degrees of regulation (or lack thereof) across Africa’s safari countries, the operators themselves are left to self-enforce some ethical standards; again, usually more so by the operators with more resources. Leading the way are private game concessions at places such as Lion Sands (in Sabi Sands), which do not chase animals (once they get them in sight) and refuse outright to track rhinos for tourists. The guides are especially careful not to give away the rhino’s positions on their radios, lest a poacher is listening in. As nature intends, you simply have to be lucky enough to happen across the rhino here (I saw a couple, anyway). Good operators respect the animals and the environment, too. I’ve seen guides (on both sides of the budget spectrum), stop their trucks to pick up a single piece of rubbish. 3. Do you train your guides and trackers? Ask the safari operator, how (or if) they train their guides and trackers. The difference between someone who just drives a beat-up LandCruiser around the savannah and a guide who’s studied at one of Africa’s academies will become self-evident after about five minutes out there. Have a few curveball questions ready to throw at your guide to test them beforehand; for example, what’s the difference between black and white rhino? If they stroll past the difference (for the record: not the colour but the lip width. ‘Wide’ was mistranslated into ‘white’) and into the plight of this ultra-threatened species, you’re probably in good hands. I met a safari group in Uganda’s Murchison Falls National Park (where Ernest Hemingway survived two plane crashes) who nicknamed their guide of five days ‘I Don’t Know’. Remember, Google won’t help you out on the plains and, ultimately, training people shows a long-term commitment to the animals and the local communities that rely upon them for income. 4. What about the savannah traffic jam? 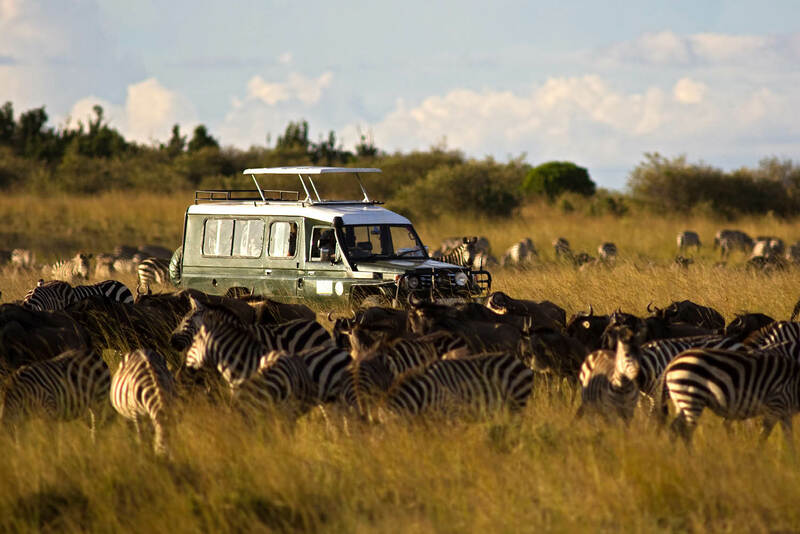 Most safaris take place in vast country-sized national parks, Kruger, Serengeti, Maasai Mara, et al, but be aware (if only for your own experience) that peak season in some parks, including the above-mentioned Ngorongoro Conservation Area, can get a more than a little crowded in peak holiday season. We’ve all seen pictures of ten vehicles circling one lion; which can feel more zoo-like than the bucket-list ticking wildlife moment you’ve saved all your life for. As I’ve said above, a safari on a private concession such as Sabi Sands will not guarantee you more interaction, but it can better your chances of a more ‘personal’ interaction with one or more of the big mammals. Like it or not, as a general rule, the more you pay for your safari the fewer people you will have in your truck and the fewer other trucks you’ll see on your game drive throughout the day. If this is your once-in-a-lifetime safari, then you are probably going to be spending quite a few mornings and evenings out on the sometimes hot, sometimes chilly, yet always bumpy African plains. Here’s a good time to start asking questions about your vehicle: How old is it? Is it a 4WD (yes, some aren’t)? Look for customised vehicles that go further than just de-roofing a LandCruiser. Heavy-duty suspension, beefy bash plates, and, most importantly, the most comfy, padded seats that money can buy (you’ll thank me after about two hours) are all important. Look for a vehicle with only two seats across and a retractable roof so everyone gets a ‘window’ when that leopard-stalking-prey moment arises. Of course, the more you pay, the more savannah extras will be added on to your comfort list: wildlife spotter’s guides, binoculars, hatches to stow your cameras, thick woollen blankets to fight the morning chill and, crucially, well-stocked mini bars for the mandatory safari sundowner. This is a GREAT article. You should pin it to the top of your Facebook page for a while. Researching and hiring a quality guide is so important. It can make or break your holiday!